Charming bungalow located in the mountain between Sainte-Rose and Deshaies 5min from the beautiful beaches of the leeward coast and walking access to the river. 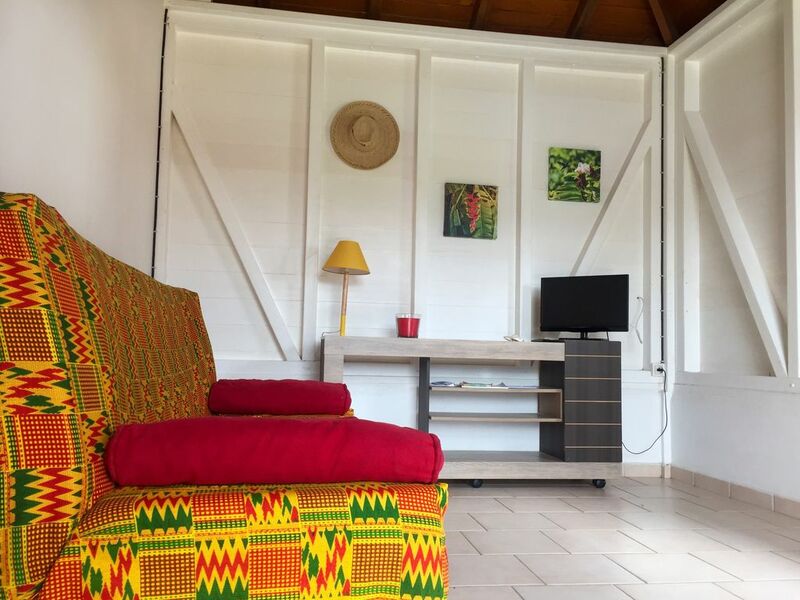 Very airy with a garden area, ideal to enjoy Guadeloupe in a peaceful setting. Composed of a room with double bed, kitchen, bathroom and living room with opening onto terrace. The room is air conditioned and a fan is available for the living room if you wish. The bungalow can accommodate couples or families, groups up to 4 people. Carbet exterior colorful and very cozy. It is equipped with a barbecue, a worktop with sink, a washing machine with drying rack and another refrigerator. The carbet and all the garden space are at your disposal, ideal for an aperitif or barbecues with family or friends. mais......on est dans la montagne?ouiiiiii!!!! La route qui redescend sur grand anse et Déhais est irréel.....c'est tout simplement fabuleux! un cadeau de bienvenue pour nous touriste.....merci Guy. Superbe habitation, détente assuré pour les vacances. Très bon accueil de la part de Guy. Bungalow très propre et agréable. Il faut aimer la campagne et les chants des coqs !!!! pour vous rendre le séjour agréable!